The frigid temperatures affecting much of the U.S., with wind chill readings as low as 54 degrees below zero in Minnesota on Monday, can be deadly. Here are some tips on how to avoid the worst effects of winter weather. Of all the health risks the extreme cold can pose, the biggest dangers are hypothermia and frostbite, which can become life-threatening. Infants and the elderly are most susceptible. Frostbite is when cell damage occurs from the cold as a result of a lack of circulation, usually to extremities like your fingers, toes and nose. Wind chill, wet clothing, alcohol consumption, poor circulation, weariness, and some medications can make people more vulnerable to frostbite. Symptoms include tingling sensations on nose, ears, toes, and fingers as well as red skin (early stage), whitened skin (middle stage), hard skin (severe), blisters, and blackened tissue (severe, gangrenous stage). Severe frostbite can lead to gangrene and amputation, so if you get the pins and the needles sensation, get inside and get warm. Warm the skin gradually. If it's your fingertips, put them under your arms; cover your ears. Do not rub the traumatized skin. You can create more damage. Hypothermia occurs when the body's core temperature drops, and doesn't occur in a matter of minutes, like frostbite, but slowly over several hours of exposure to cold. Wearing wet clothing or being immersed in cold water for any length of time heightens the risk. The possible result: coma and death. Hypothermia can even occur indoors, if you have a home that's hard to heat. Signs include violent shivering, slurred speech, slow pulse, loss of coordination, loss of bladder control, stiff muscles, a puffy face, and mental confusion. 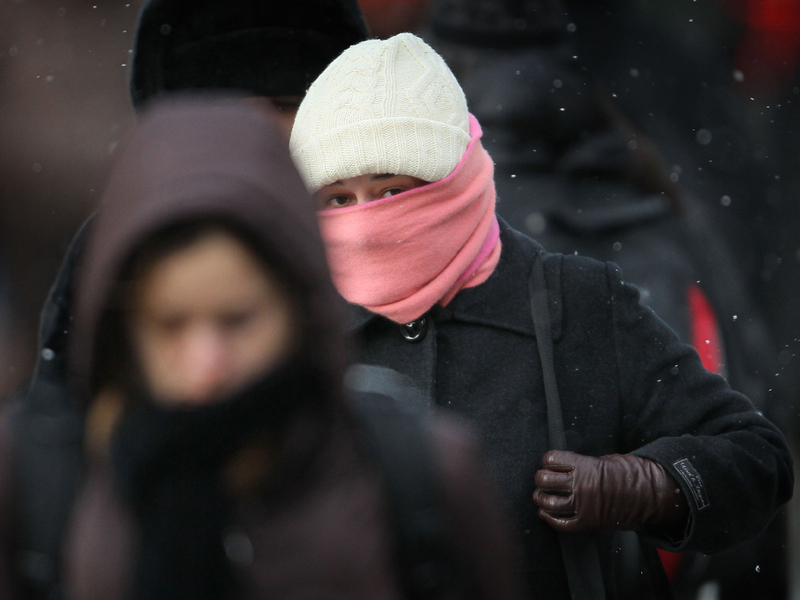 Dr. Joseph Clinton of Hennepin County Medical Center in Minneapolis told CBS Station WCCO that shivering is the body's attempt to get the muscles to cause more heat, to bring the temperature back up. Heartbeat and breathing rates will also speed up. "All these mechanisms go on to maintain heart and brain in functioning capacity," Dr. Clinton said. When your thinking gets cloudy and the heart begins to slow, hypothermia is not far away. "The problem with hypothermia is that patients that are becoming hypothermic may not realize it," Dr. Clinton said. If you suspect hypothermia, call 911 immediately or get the person to an emergency room. Half of cold-related injuries happen to people over 60 years old. So people should show special concern for older neighbors, friends and family members. They should look in on the elderly individual, make sure utilities are working and medical prescriptions are filled, and offer to pick up food or home supplies. To avoid both conditions, wear lots of layers of clothing. Cover your head, ears, nose and hands. Wear warm footwear. If you have a cold house, keep one room at seventy degrees. Sleep with extra blankets, a cap and socks. Also, avoid alcohol. It's a common misconception that alcohol helps keep you warm; on the contrary, it constricts blood vessels and it can make you more susceptible to the cold. Don't use a gas oven if your heat goes out. Gas ovens may blow out or not burn efficiently, leading to carbon monoxide poisoning. To prevent a buildup of carbon monoxide inside your home, have your furnace and heating appliances checked every year. Move items away from your furnace. Install a carbon monoxide detector or check already-existing detectors. When buying a kerosene heater, make sure it has a low center of gravity to make accidental tip-overs unlikely. Carefully read and follow all safety directions, including keeping small children away from the heater and instructing them not to touch the controls. Since kerosene heaters have an open flame, do not use flammable solvents or sprays in the same room. Never leave a heater on when unattended. Never leave burning candles unattended. Extinguish when you go to bed. Put them out of the reach of children. Do not place near flammable things, like curtains, paper, cleaning products. Never operate grills or motor vehicles in garages or carports.